Hey everyone. Here is an F1 of a 7 pot Jonah x pimenta da Neyde cross I made last year. 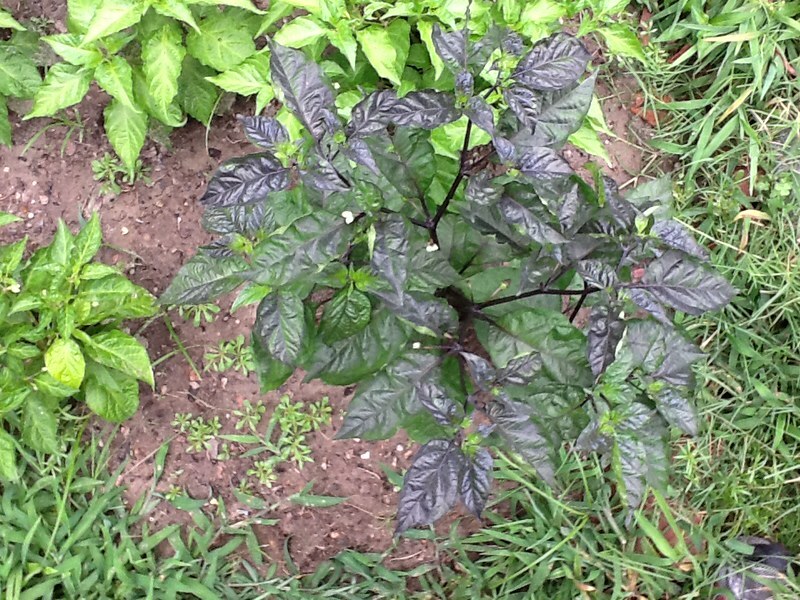 I used a 7 pot Jonah as the female so I could tell right away that the cross worked from the purple foliage. After the end of this season I'd like to spread the hybrid seeds around like Patrick did. I love the results from the community growing the SB7J. I'll send people interested in growing new strains out of this cross seeds via sabse. I'll keep everyone posted. I think the will ripen to red (I'm assuming ripening to red is dominant). Dude, I just got half a chub. Sign me up. Lol, Sure thing. The mother Jonah was from a Jonah seed you gave me . Both parents grew true as can be . Those look amazing!!! What a great idea for a cross! Sign me up please. me too please. looks great. Love it! I'm all over this one when you have seeds to spare. Awesome job. me to if possible i would love to part take in the stabalization of a new pepper. how hot are they? Edited by newpeppergrower1105, 09 August 2013 - 05:24 PM. very cool what are you gonna call it pimenta de dulac ? I don't know yet. I'll let everyone know and give pictures of the guts. I'm still waiting for them to ripen. The 7 pot Jonah is nuclear and the pimenta is somewhat hot. IMO both the 7 pot Jonah and pimenta da Neyde taste good, so I think the flavor can't go wrong. I get a lot of complements on my 7 pot Jonah sauce, which is just 7 pot Jonahs and vinegar pretty much. For now I'm just going to call it 7 pot Jonah x Pimenta da Neyde. I'm going to see what the offspring look like before naming anything. I'll probably keep 7 pot in the name to indicate it's nuclear (I think they will be superhot). Edited by Dulac, 10 August 2013 - 09:59 AM. I would love to grow them as well. 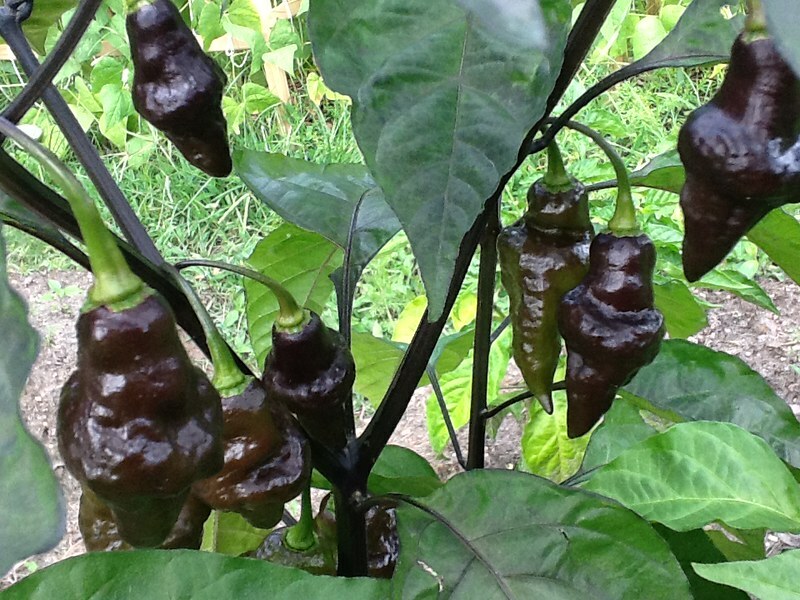 I was looking around for a purple chili to grow next year and a purple type of 7pod would be awsome! love both the PDN and 7 pots so i hope you get a nice variety out of these plants. those look awesome!!!! sign me up please! I would love to participate. Where do i sign up and send SASBE? Sounds like this is gonna be a freaking cool pepper. Cant wait to see how they turn out. Dulac that has to be one the nicest looking plants and pods i've seen, looks good enough for landscaping. Hopefully you can stabilize a line to keep it looking like that. Looking forward to future updates. Edit: Count me in, but only if you have enough after everyone else. I would update, take pics, isolate both the plant(s) and flowers, no re-crosses. Edited by Jetchuka, 16 August 2013 - 07:13 AM. I'm going to contact everyone in the thread at the end of the season. I need to see how many seeds I get to know how many i should give out. It will first come first serve if there are not enough seeds. I don't think there will be a problem though..
Yeah, I wasn't expecting it to have a large midsection. I wonder why that happened, lol I'm going to let everyone know when they are ripe. I'm not sure if they are going to turn red or not. They've been there for awhile. However, I picked the pimenta da neyde peppers last year, thinking they were ripe, and got no viable seeds, so I was unable to grow the pimenta da Neyde this year. Thanks! I'm going for beautiful, tasty, and hot with this cross. I cannot see how the taste or heat could go wrong with the two parents . Edited by Dulac, 14 August 2013 - 01:19 PM.